Lieutenant-General J-M Lanthier, Commander Canadian Army and Canadian Army Sergeant-Major, Chief Warrant Officer S. Hartnell inspect troops. Photo by Trooper Marc-André Leclerc, 5 Canadian Mechanized Brigade Group Public Affairs. ©2018 DND/MDN Canada. That most special time of year is upon us once again and Chief Warrant Officer Stu Hartnell and I would like to send our best wishes to the entire Canadian Army family. One of the first things that CWO Hartnell and I did upon assuming our positions was to conduct a tour of the Divisions. I must say that what we saw was impressive. We were greatly encouraged to see soldiers exemplifying the values and ethos of our profession of arms. Reflecting on the year that has passed, I can say with confidence that I have never been prouder to serve beside and lead our men and women in uniform as well as the civilian members of the Canadian Army Team. Strong, Secure, Engaged: Canada’s Defence Policy continues to be implemented with a high degree of success. This past year, we saw the Strengthening the Army Reserve (StAR) initiative continue to evolve with the implementation of the Army’s full-time summer employment for successful Army Reserve applicants. We also saw the delivery of C-19 Rifles to the Canadian Rangers who continue to play a critical role in national security and public safety missions in the northern, coastal and isolated areas of Canada. These and other components of the StAR initiative will continue to be at the forefront of our priorities in the New Year. 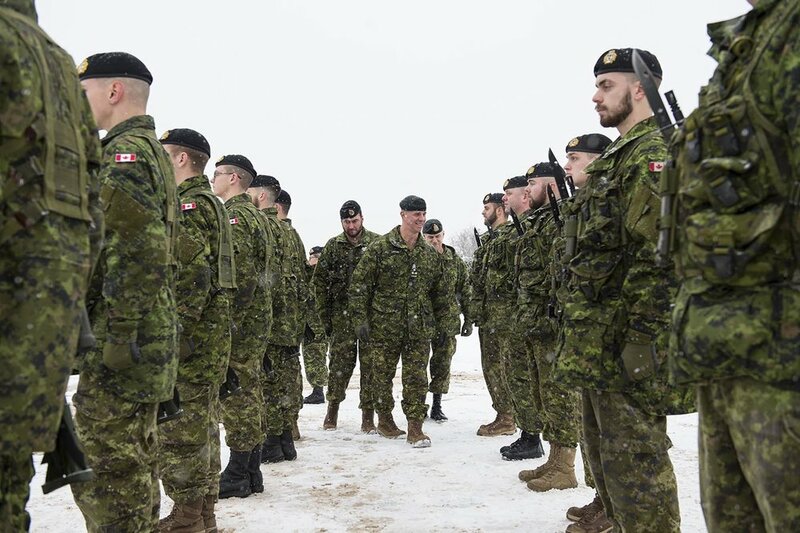 As always, this past year the Canadian Army was called upon to serve Canada and our Allies time and time again, and our personnel have continued to deliver at the high standard that is expected of them. Our soldiers are deployed on four continents and twelve countries around the world at this time. Recently, the Army Sergeant-Major and I had the pleasure of visiting our soldiers serving on Operation REASSURANCE as part of NATO’s efforts in central and eastern Europe and Operation UNIFIER in Ukraine where our members have continually shown their ability to support and serve alongside our Allies. Canadian Army members are also helping to set the conditions for durable peace, development and prosperity in Mali as part of Operation PRESENCE and are serving in Iraq and Kuwait on Operation IMPACT in support of the Coalition fight against Daesh. Canadian Army soldiers have once again risen to the occasion through their high level of dedication and professionalism, which has become the standard that continues to inspire CWO Hartnell and myself in the performance of our day-to-day duties. On a different note, last month the Army Sergeant-Major and I visited the soldiers of the 3rd Battalion, The Royal Canadian Regiment and the Royal Canadian Artillery Band as they conducted Guard Mounting duties at Buckingham Palace in London, England. Witnessing the Guard Mount provided us an opportunity to reflect on our Canadian Army origins, as well as the values that we share with our Allies. Looking forward, it is important that we continue to celebrate our past and, at the same time, continue to develop and commemorate new traditions. A special thank you goes out to all of our members and their families who are serving outside of Canada and overseas during the holidays. Without your tireless efforts, the Canadian Army wouldn’t be able to accomplish its tasks and missions. During this time of year, we would like to remind all members of the Army Team to take care of yourselves, your loved ones and your colleagues. Enjoy some well-deserved time with your family and friends throughout the holiday season. We also urge that if you or someone you know is struggling, to reach out to them. Help and support are always available. CWO Hartnell and I wish you and yours a joyous and safe holiday season and a Happy New Year.